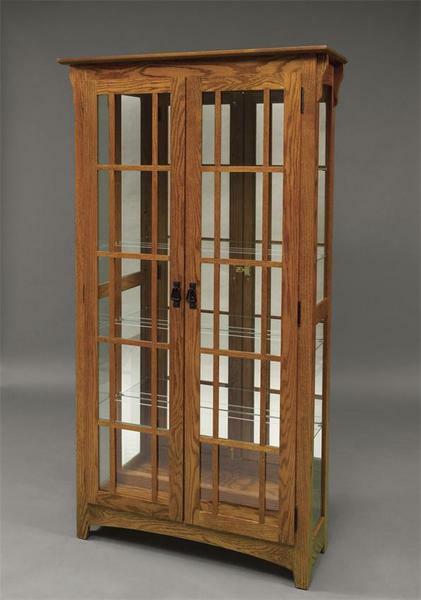 The Amish Misson Double Door Curio is ideal for the dining room, family room, foyer or office. Bring those treasured collectibles that are attached to fond memories and display them in this handsome piece to enjoy and discuss. Mission style furniture has remained popular over the years with its natural look and versatile qualities. At DutchCrafters we provide you with choices to custom build furniture to reflect your personal style. Consider our Deluxe 3 Piece Sliding Door Curio Cabinet for a larger option that provides a display case included in a magnificent piece of Amish Furniture.